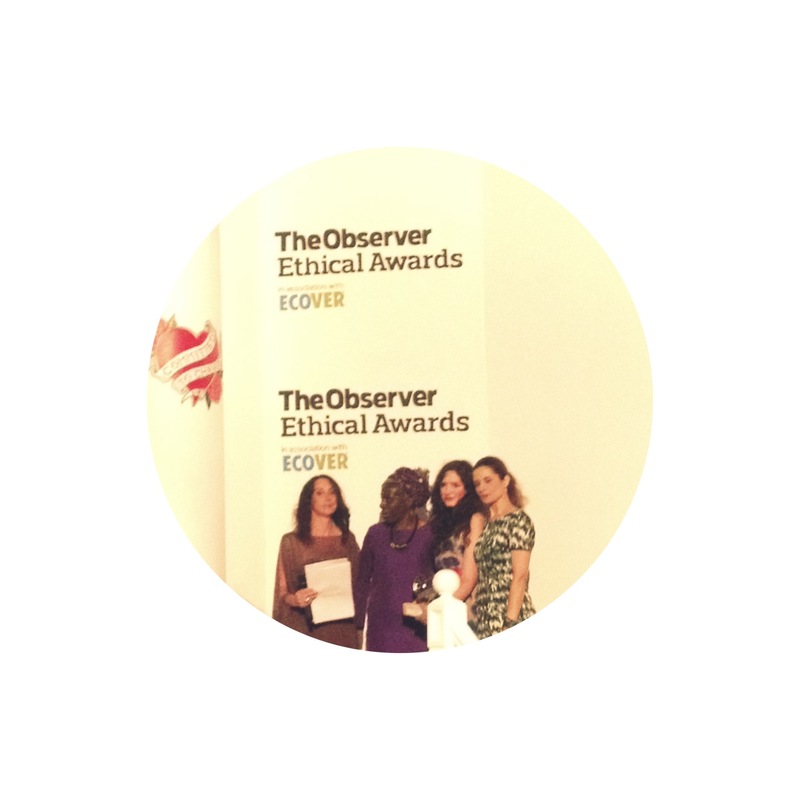 What to wear to an ethical awards ceremony? As I considered my clothes rail, trying to choose an outfit to represent Craftivist Collective at The Observer’s Ethical Awards celebration of environmental and social justice, it quickly became evident that passing the Green Carpet Challenge really isn’t a straight forward task. I was honoured to attend the awards ceremony last Thursday along with Sarah Corbett. As two proud, slightly networking-averse craftivists, we were excited and humbled to be invited to take part in the ‘Green Oscars’ on behalf of everyone who calls themselves a craftivist. Craftivists, supporters and even craptivists amongst you should be proud to be part of this recognition by the public (thanks for nominating) and the judges (who shortlisted us & included a wide range of ethical ambassadors and champions). After a short film featuring Craftivist Collective was screened, Ben Okri (poet, novelist and Ethical Awards judge) revealed that the trophy for the Arts and Culture category was to be awarded to the film Beasts of the Southern Wild. My heartfelt applause couldn’t have been more genuine if Craftivist Collective had won (well, nearly anyway). It really is hard to feel disappointed when you’re 1 of 2 other runners up to a 4 times Oscar nominated beautiful piece of film making magic. Beasts was my favourite film of 2012, with the indomitable lead character Hushpuppy becoming perhaps the strongest female character I’ve ever seen on screen, despite being played by 6 year old newcomer Quvenzhané Wallis. Small but mighty, indeed. In the Observer on Sunday, the winner of the Unsung Local Hero Award Francis McCrickard echoed Hushpuppy’s words, saying that his efforts across his life to protect and conserve British woodlands are motivated by a belief that we all “have to be stewards of creation”. It was the efforts of individuals- young, small, extraordinarily ordinary people- that really struck and inspired me within the awards list. Yes, seeing the celebrities was exciting on the night (Colin Firth! Ben Fogle! Lenny Henry!) but perhaps the most inspiring stories were of those at the beginning of their activism journey. The Ecover Young Green Champions shortlist highlights those taking action and making change whilst still at school. Millie Barrow from Queen Elizabeth II High School was passing around an unusual hat for awards attendee to smell, which turned out to be ‘grown’ from natural materials using green tea, sugar and bacteria (hence it being a particularly fragrant accessory). Wanting to get their friends at school thinking about sustainable fashion through this innovation, the group of AS students developed this organic idea. it’s fantastic that through winning this award funding and publicity should help nurture this science experiment and the creative campaigning further. Another female student deservedly recognised on the night was Malala Yousafzai. Malala was named International Campaigner of the Year, adding to an array of accolades (including the youngest ever Nobel Peace Prize nomination) recognising her role as an activist for girls’ right to education in Pakistan and around the globe. Whilst not able to attend in person, Malala reminded me that not all girls top rated online generic pharmacy have the freedom of education like Queen Elizabeth II’s students, and that the right to education and freedom to protest and campaign need to be defended by those who can speak up on their behalf. Whether for girls like Malala’s classmates denied education in parts of Pakistan, or children of both genders forced to work to source materials and allow the manufacture of clothing cheaply at the cost of their own education, if we have a voice we can speak up for them; whether in words or in stitches. The true costs of fast fashion was certainly high on the agenda as an issue being addressed by many nominees and this year a new category was launched, with another notable female student Rosalind Jana receiving the first ‘ Well-dressed Award’. Rosalind has committed to the challenge of rejecting fast fashion for the past three years; wearing as much second hand and vintage only sourced clothing as she can since being inspired at aged 16 by Lucy Siegle’s book To Die For. Lucy Siegle, the Observer’s ethical columnist, founded the awards and led the proceedings on the night. Our host was evidence that fashion and compassion can go happily hand in hand as she wasn’t afraid to show her emotion for the stories being expressed on the stage whilst looking stylish in a look I shall dare to call ‘green Grecian.’ But it’s encouraging to find out, via twitter, that she equally struggled sorting out her outfit for the event. I wasn’t alone! 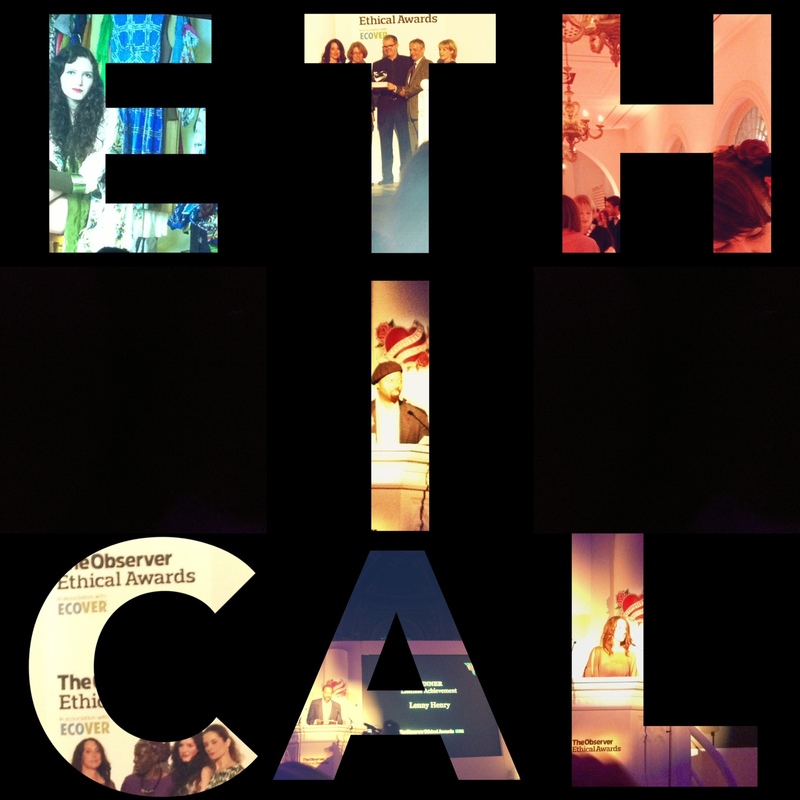 From Livia Firth of Eco-Age and The Good Wardrobe’s Zoe Robinson to VV Brown (sat in the row behind us), the venue One Marylebone was bursting at the seams with inspirational figures who are not only deeply passionate about sustainable fashion but doing something about it. I’ll be looking further to them all for ideas and support for our Autumn campaign, such as Baroness Lola Young who is chair of the All-Party Parliamentary Group on Ethics and Sustainability in Fashion. She emphasizes that whilst we as consumers can be powerful agents of change, the systems, businesses and government also need to be challenged to change in order for real progress to occur. It’s not a simple issue, once you start unravelling the threads. 2) I’m happy that Craftivist Collective’s next project will allow me the opportunity to focus more on the clothing choices I make, the multi-layered issue of sustainable fashion and follow the journey of my footwear from production to retail to my feet. 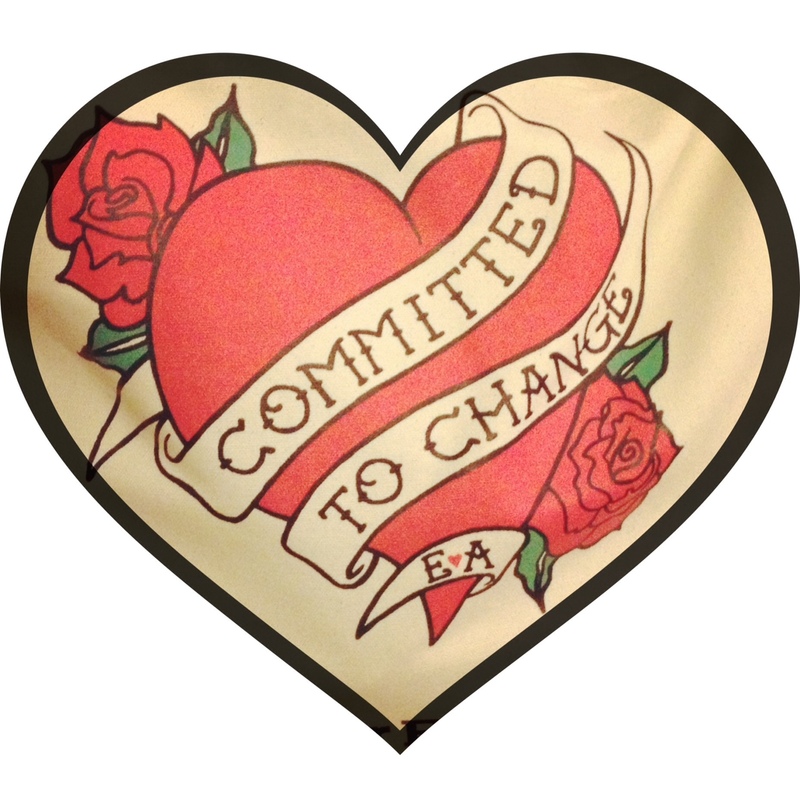 3) I’m committed to change. With a little help from my craftivist friends. One step and stitch at a time. A full list of the winners and runners up, more information about the judges and photos from the awards can be found here, to find out more about the stories of those involved.